Thomas Liesching started experimenting with game design in the 1990s, going as far as joining the German game designers guild (SAZ). He had been tinkering with ideas for a treasure hunting game for a while, but after watching the film Niagara — a 1953 production starring Marilyn Monroe — he suddenly had the idea of collecting gems while on a rushing river. Liesching experimented with different versions of the game over the course of years. When he started showing it to publishers, they were intrigued by the idea, but none of them were interested due to the high costs in producing such a game. Liesching’s big break came in 2000, when he showed it to Klaus Zoch at a trade show in Stuttgart. Zoch recognized that the game had potential, and Niagara spent the next several years in development. The game was finally released in late 2004 by Zoch and Rio Grande, and it immediately achieved critical acclaim, with the gaming community recognizing it as an early contender for the Spiel des Jahres. In giving Niagara the award, the jury cited the cleverness of the game’s main mechanism, calling it an intense gaming experience in an adventurous environment. Niagara placed second in Deutscher Spiele Preis voting that year, losing to Louis XIV. Niagara was Liesching’s first published game, and he hasn’t done much since: his only other game of note is Dschamál, which was published in 2005 and which is currently ranked 4,884 on BGG. He has, however, released a couple of expansions for Niagara: Diamond Joe and Spirits of Niagara. Niagara is still in print, and it is relatively easy to find. You can also play it online at Board Game Arena. 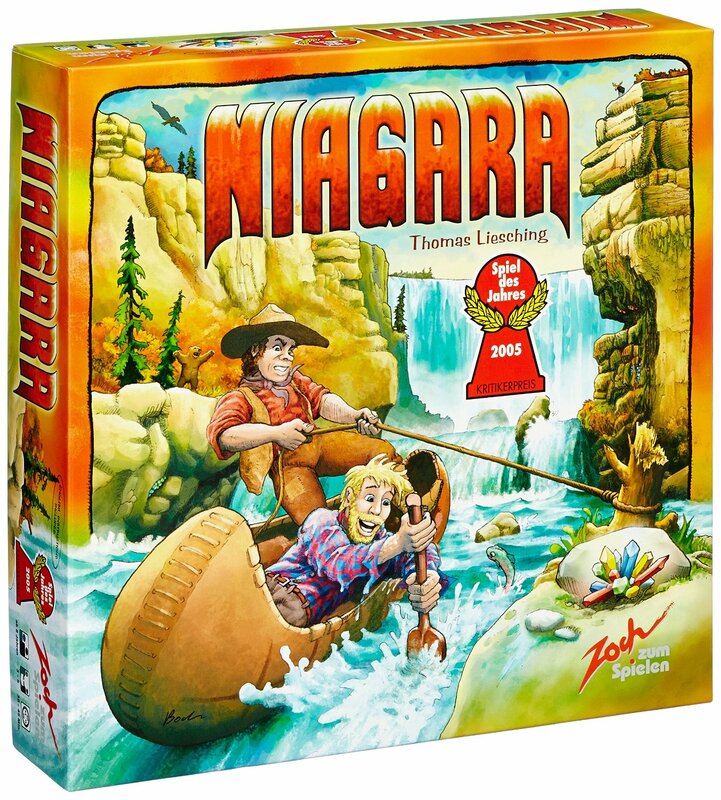 In Niagara, you control a team of canoers who are battling to collect gems along the river bank. You need to move your canoe such that you grab gems, but you also need to be careful or you’ll go over the waterfall. The winning player will be he who first collects either five different gems, four of the same color, or seven of any color. At the start of the game, each player takes two canoes and their set of paddle cards. Each player’s hand has seven paddle cards: six numbered 1-6 that move a canoe, and one that influences the weather. The start player takes the life preserver (which is the starting player marker) and the weather track is set to zero. 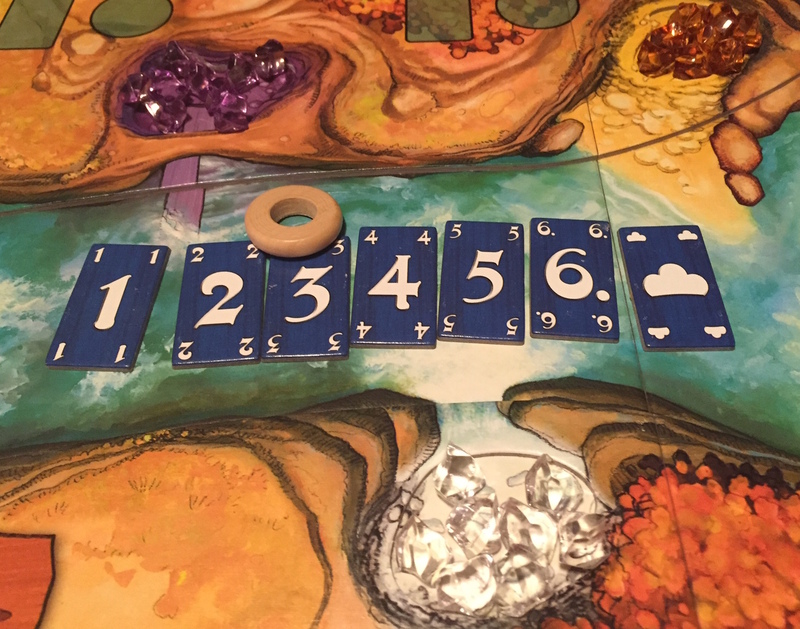 Each round proceeds in four phases: (1) selecting padde cards, (2) moving canoes and influencing weather, (3) moving the river, and (4) giving the life preserve to the next player clockwise. In the first phase, each player lays a paddle card. They are placed face down and revealed simultaneously. Paddle cards do not come back into your hand until all seven have been used. When moving canoes, a player must use your full amount of paddle points. Loading or unloading a gem costs two spaces, and these two spaces must be spent either before or after the move. Gems can be unloaded in in the spaces where they can be picked up, but only gems unloaded at the docks to go into the player’s collection. You can steal gems for no movement points if you end your turn after moving up river on the same space as a player with a gem. This costs no movement points, and it can be done even if you start your turn by unloading a gem. If a player plays the “influence weather” paddle card, he must move the cloud on the weather track one space up or down (and thus he cannot leave it where it is). When a canoe falls off the waterfall, the owner loses it. Any gems that fall over are placed back in their staring space. If the player still has a canoe in play, he has to pay a gem of any color to place it back on the starting riverbank. If a player loses his second canoe (i.e. he has none in play), he gets one back for free. After the first three phases are complete, the life preserve is passed, and the steps are repeated. The winning player will be he who first collects either five different gems, four of the same color, or seven of any color. Niagara is clever, a unique design that is worthy of the praise it has earned. It offers a memorable experience with novel gameplay and beautiful components. While I’m ultimately ambivalent about the game, Niagara has a permanent place in my collection, and I recommend everybody give it a try. The game’s rules are simple, but there is a surprising amount of depth. Though it can be learned in just a few minutes, Niagara takes three or four plays to figure the game out, even for experienced gamers. There is no randomness, and the core of the game is figuring out what your opponents will do. This guesswork regarding your opponents — plus the fear of going over the dreaded waterfall — heightens the game’s tension. It is easy to be mediocre at Niagara, but being good at the game requires planning and closely monitoring your opponents. Good Niagara players look not only at the location of their opponent’s canoes (everybody seems to do that), but also the color of their opponent’s gems (to identify how they’re trying to win) and the paddle cards they’ve used (to see what they can use in the future). The game can have a lot of moving parts (pun intended), but in the end the victor will usually be who has taken tactical advantage of his opponent. Experienced players always have a leg up. Niagara is fun for the whole family. Kids seem to love it. That said, I’ve played with kids, and unlike with a lot of other SdJ winners, they never seem to get the strategy. And in the end, Niagara can be a bit cutthroat for younger players: you steal gems from each other, and the penalty for going over the waterfall can be harsh, particularly towards the end of the game. Niagara’s biggest feature is the beautiful game elements and novel gameplay. The board is beautiful, the components are high quality, and the theme is fun and well-implemented. Add in the originality of the design, and it is easy to see how it won the Spiel des Jahres. That said, for me, the game is forgettable. I don’t dislike playing the game, but it isn’t the sort of game I voluntarily pull off the shelf. My sister loves it, and I play with her on occasion, but otherwise it just doesn’t seem to drive enthusiasm among my game group. Looking at it objectively, there’s a good game here. But in the end, I find it a bit gimmicky and chaotic. And more importantly, I’ve had one too many plays go way too long: if played aggressively, this game can last a while. And towards the end of the game, I’m always praying for somebody — anybody — to just end it. I don’t mind the first half hour, but this game wears on me for the second half hour. Would it win the Spiel des Jahres today? Possibly. The game doesn’t feel dated at all, and given the jury’s recent penchant for picking flashy 3D games (Camel Up, Colt Express), I could see them picking a game like Niagara. It hit all of the right notes in 2005, and it still does a decade later: it is family-friendly, well-produced, and original. Patrick Brennan: For a light SdJ winner, it’s not too bad. It’ll never be a favourite because of the simultaneous revelation mechanic, but you get choices on whether to play your own game or try and outguess other players to steal their jewels. And it is a nifty component design, for sure. Andrea “Liga” Ligabue: Niagara is a game I’m always happy to play and use in my games laboratory with kids. It is simple, challenging and with a great mechanic. How the river is implemented is great. Of course is not a gamers’ game but I think it is what a family must expect from a Spiel des Jahres. Greg S.: I was never a big fan of Niagara and found it to be mediocre, at best. The card play didn’t intrigue me (I rarely enjoy simultaneous card play) and I found the game to be rather bland. It was probably the first time… but certainly not the last … that I was severely disappointed by the SdJ committee’s selection. Larry: One of my least favorite SdJ winners. I honestly don’t see the point of the game. It doesn’t help that I dislike simultaneous selection so much, but even taking that into account, there doesn’t seem to be much game here. The truly sad thing is that Around the World in 80 Days, which was also nominated that year, would have made a terrific SdJ winner. Hard to figure out the Jury sometimes. Mark Jackson: While Larry & I agree (now) that Around the World in 80 Days would have been a terrific SdJ winner, that doesn’t diminish the enjoyment I get from playing Niagara. 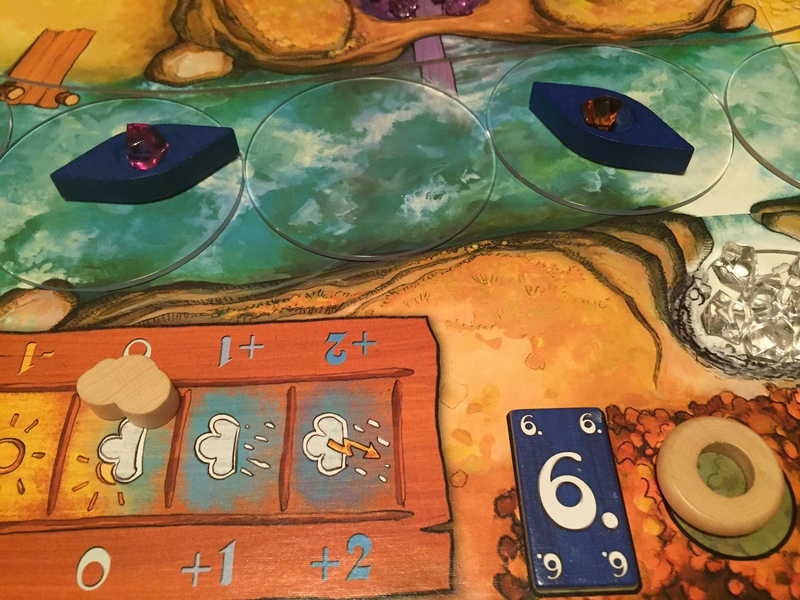 We think that The Spirits of Niagara expansion is an excellent addition to the game, adding more interesting decisions and slightly speeding up play. Matt Carlson: I love the bits. I didn’t get to play it until some time after it won. I still have it in my collection, but it’s really only hanging on because I can use the cool layout to attract new gamers to the game. I like it. Andrea “Liga “Ligabue, Mark Jackson, Matt C.
Neutral. Chris W., Patrick Brennan, Greg S., Joe H.
This entry was posted in SdJ Re-Review. Bookmark the permalink.